McNeil River originates from glaciers and alpine lakes located high in the mountains of the Aleutian Range. As the river makes it way toward the shores of lower Cook Inlet in southwestern Alaska, it provides sustenance to an array of wildlife, most visibly salmon and brown bears. The Alaska State Legislature designated the McNeil River area as a wildlife sanctuary in 1967 (and enlarged it in 1993) to protect the world's largest concentration of wild brown bears. As many as 144 individual bears have been observed at McNeil River through the summer with as many as 74 bears observed at one time! The sanctuary protects about 200 square miles of wildlife habitat and is located approximately 250 air miles (400 kilometers) southwest of Anchorage and 100 air miles (160 kilometers) west of Homer. In addition to brown bears and salmon, red fox, arctic ground squirrels, harbor seals and bald eagles are commonly observed. Other wildlife that may be observed in the sanctuary includes moose, caribou, wolves, wolverine, various furbearers, waterfowl, sea ducks and sea birds. McNeil River and nearby Mikfik Creek drain into Kamishak Bay in the shadow of Augustine Island, an active volcano. This is a roadless area with no modern amenities and it is virtually undisturbed by human development. Although all five species of Pacific salmon are present in the sanctuary, it is the calico-colored chum (or dog salmon) that primarily attracts bears to McNeil River in early July through mid-August. About one mile (1.6 kilometers) upstream from its mouth, a series of rocks and boulders forms McNeil River Falls. Salmon are slowed in their movements by the falls and they congregate there during their upstream migration to their spawning grounds. Since there are few rivers in the area with similar fishing sites, bears congregate at McNeil River Falls in numbers that have brought McNeil River worldwide fame. During June, a smaller number of bears (generally 15 - 20) are attracted to nearby Mikfik Creek by migrating sockeye (or red) salmon. During this period, visitors observe bears from a variety of sites on or near the creek while the bears catch fish and graze on tidal vegetation. Preservation of these wildlife habitats and the unique brown bear concentration is the primary management goal of the Alaska Department of Fish & Game at the McNeil River Sanctuary. This means that all human activities must be compatible with this primary management goal. In the past, the sanctuary has served as a valuable part of the department's investigations into the life history of brown bears. An access permit program administered by the Alaska Department of Fish & Game manages visitor numbers and activities in the sanctuary. The access permit program was developed after many years of excessive and uncontrolled public use of the area that often put people and bears in danger. The goal of the access permit program is to provide the public with an opportunity to view and photograph bears while minimizing their impacts to bears and wildlife habitats. The program limits the number of people who may be present at McNeil River Falls (or the other viewing locations) to no more than 10 individuals between June 7 and August 25. No one has ever been injured by a bear at McNeil River and since the permit program was initiated, no bears have been killed by visitors who felt threatened. To maintain this record, visitor activities at the sanctuary are closely managed and evaluated. However, it is always important to remember that the McNeil bears are wild animals with all the potential for aggressive behavior, so visitors are accompanied by armed department staff. Visitors are encouraged to maintain respect of the brown bear's home, follow the rules of the sanctuary and your guide, and to have a truly memorable experience. 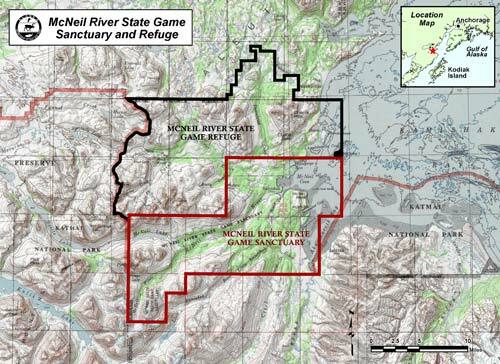 For more information on the McNeil River State Game Sanctuary and Refuge please refer to the McNeil River Management Plan. For current land status information, see the McNeil River Land Status Map (PDF 956 kB). You may also download the KML file which depicts the refuge area boundary.